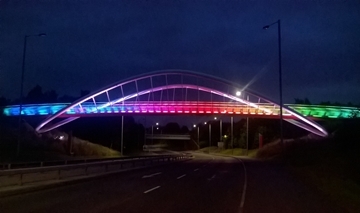 St Helens Council is pledging its support to Liverpool Pride, with the Steve Prescott Bridge being illuminated in rainbow colours – the symbol of LGBT+ pride. Liverpool Pride is one of the North West’s biggest lesbian, gay, bisexual and transgender (LGBT+) festivals. The bridge is among numerous iconic Merseyside buildings and landmarks to join the festival’s Come Out of the Shadows campaign, including Liverpool’s Liver Birds. Liverpool Pride (29-30 July) welcomes visitors from across the country for a vibrant and colourful march, numerous stalls, arts and entertainments, all in the spirit of equality and tolerance. The festival was established in 2010 following public outcry at the murder of gay teen Michael Causer, who was killed at a house party in Huyton in an attack allegedly motivated by hate crime. A charitable foundation was set up in Michael’s name by his family, seeking to protect and support young LGBT+ people at risk. The St Helens No Place for Hate campaign asks residents to sign an online pledge – demonstrating their commitment to stamp out hate crime locally, and will be supported by a social media campaign. Learn more about Liverpool Pride at liverpoolpride.co.uk.